This has been a dream come true. We have always wanted to grow this lovely vegetable in our garden. Valche bhajji brings back so many fond memories of home meals. I can remember this vegetable being cooked at home very often when the family wanted to detox. Mum would serve valchebhajji sukke with pej/ kanji ( rice cooked and served with water), galmbi chutney ( dried prawn chutney) or fried fish, and ambe che lonche (mango pickle). A wonderful treat. The journey of our home grown valche bhajji from a stem to a healthy green tender vine has been long and emotional. We brought back 5 stems of the vine from India to the UK following our christmas holiday. At the time UK was in the peak of winter ( including snow). Put them in water on a window sill and watched them everyday for signs of life. There were moments when we lost all hope, with the cold 3 of the 5 stems died. 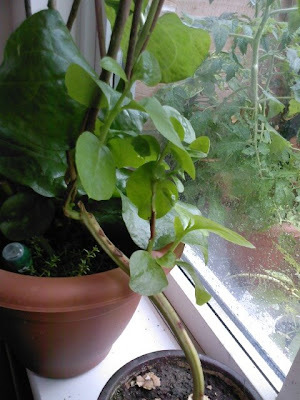 Hubby not ready to give up, potted, nurtured and cared for the remaining 2 stems through the winter months into spring. It took around 4 months for us to see the first signs of life in these stems. And since then they have grown into the most beautiful green vines with extra large green leaves and thick tender green stems. To manage the growth of the vine hubby trimmed the branches last week. The trimmings were sufficient for a mini feast. We decided to make a simple valche bhajji sukke out of it with minimum spice to retain the flavour of the vegetable. The dish was tasty and enjoyable. Most of all it gave us a sense of VICTORY!! 1. Wash valche bhajji leaves and stems. Seperate leaves from main stem and chop large leaves into halves, cut the stems into 4 inch pieces. 2. In a closed vessel place the stems with onions, tomato, green chillies, ginger, coconut, salt, half a cup of water and 1/2 tsp oil , and bring to a boil. Then turn down flame to medium and cook for a few minutes till stems are tender and cooked. 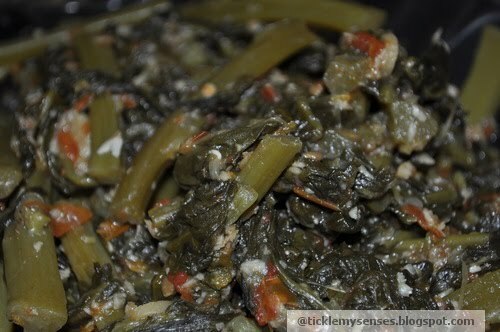 Then add the prepared leaves and cook without lid till the leaves wilt and are done. Taste for seasoning. 3. In a pan heat 2 1/2 tsps oil. Add crushed garlic flakes and fry till brown and fragnant. Tip seasoning over the valche bhajji. Serve hot. Tip: If you leave the vessel open while cooking the leaves, the leaves will retain their natural green colour. 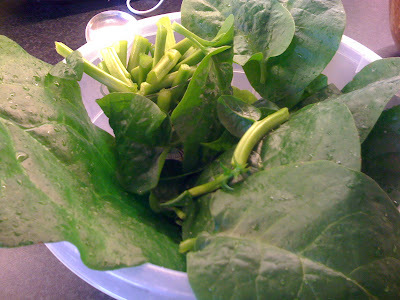 Food Fact: Distantly related to the vegetable spinach is the valche bhajji (in konkani) or Buffalo Spinach in English. Its botanical name is basella alba. This is a fast-growing, soft-stemmed vine with heart-shaped leaves and thick, semi-succulent stems. It is high in vitamin A, vitamin C, iron, and calcium. It is low in calories by volume, and high in protein per calorie. The succulent mucilage is a particularly rich source of soluble fiber, thought to remove mucus and toxins from the body. The plant is also a rich source of chlorophyll. Thanks for sharing this recipe. I tried my luck to find valche bhajji in Indian super-marts across the UK but in-vain... using alternate spinach. Hi Anonymous....thankyou for stopping by......we love valchi bhaji and were desperate to grow it here. Suprisingly it grew really well between spring and end of summer.But come winter the plant died with the cold. We keep the vine close to a window in the kitchen and has worked great for us. Also tried using cow manure and plant vitamins which I guess helped as each leaf grew really large. Thankyou for stopping by.....Its really hard to find valche bhaji in the UK...almost impossible....but a good substitute is the whole leaf spinach at Tesco's or sometimes we get the frozen whole leaf spinach ( make sure its not chopped) at ASDA or TESCO....works great.